The Lower School program at Liberty Christian School provides a strong academic foundation to first through fifth graders in a safe, caring environment where students are taught according to their unique giftedness. Our desire is to encourage a love of learning, curiosity, and intrinsic motivation within our students. Surrounded by a community of teachers who share a love for Christ, the elementary years are also a time for children to continue to grow in their faith. Students are taught a broad overview of the Bible with emphasis on different areas at each grade level. Through class devotions, Bible, shorter catechism instruction and Chapel lessons, students are encouraged to focus on various Christian character qualities. Class size. The average class size in Liberty Christian’s Lower School is 16 students and enrollment is limited to no more 23 students. Instructional Aides. Liberty Christian School’s first and second grade classes each have a teacher’s aide who assists the teacher with small group instruction, reading, math and other academic areas. Resource Teacher. This teacher provides instructional assistance to Lower School classroom teachers as well as additional enrichment activities to students who may require more individualized instruction. Multi-level Reading and Math Instruction. 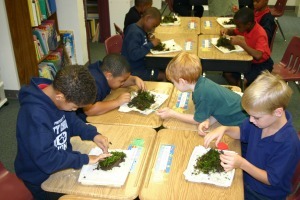 To meet the unique learning needs of its students, LCS offers several levels of reading in each grade throughout the elementary years. Reading and language instruction is rooted in a phonics-based philosophy. In addition, beginning in grade one, we offer on-grade and above-grade level math instruction. Our spiral math curriculum continually reviews, reinforces and builds upon concepts as students progress through the school year. Dynamic Specials Instruction. LCS has well-developed and resourced specials programs in Art, Music, Media, Spanish, Computers and Physical Education. As a result, students are able to develop their talents and interests and become well-rounded individuals. As a teacher, I use results from Multiple Intelligence and Learning Style inventories and activities to implement classroom lessons that will engage each learner. As a result, students become self aware of their learning styles and I am able to build upon each learners' strengths and weaknesses to develop well rounded students.